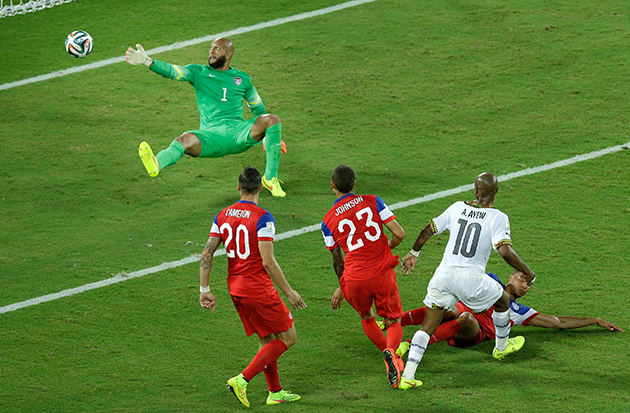 NATAL: German-born United States defender John Brooks came off the bench to stun Ghana with a late winner in a 2-1 victory in Natal on Monday to put a huge dent in the 2010 World Cup quarter-finalists hopes of emulating that feat this time round. 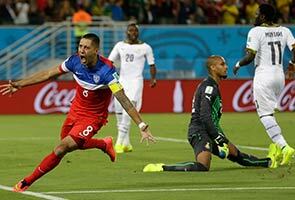 Clint Dempsey scored the opener after just 30 seconds and Brooks headed a dramatic winner. Andre Ayew equalised for Ghana eight minutes before the end. But Brooks' first goal for his adopted country avenged defeats to the same opposition in the past two World Cups, the latter when Ghana went on to the quarter-finals. It was only the third time in 12 matches at the World Cup finals that the Americans had managed to score more than one goal. The result left Ghana, who four years ago became only the third African side to qualify for the quarter-finals, with a lot of work to do to get to the second round with matches to come against Germany and Portugal. Germany had earlier destroyed Portugal 4-0. Ghana's minds appeared elsewhere after kicking off and they were made to pay when Dempsey deftly collected from Da Marcus Beasley as he ran down the left flank. As Ghana's players looked on, the US captain feinted his way into the area before dribbling past defender John Boye to coolly sweep a left-footed shot past Adam Kwarasey at the keeper's far post. Klinsmann, who won the World Cup with Germany in 1990 before coaching the Germans to third place as coach in 2006, exploded with joy on the bench as the US celebrated scoring the fifth fastest goal in World Cup history. The USA came close to snatching a second two minutes later when Jozy Altidore collected a low cross from the right to sweep the ball towards goal before the ball was caught in a tangle of Ghana legs. Minutes later, the big American striker was carried off on a stretcher after pulling up holding the back of his left thigh while chasing down Michael Bradley's punt. Dempsey then felt the full brunt of Boye's shin during a mid-air challenge, the American requiring treatment for what could be a broken nose but the grizzled veteran stoically played on. However the Africans wasted their best chance of the half in added-on time when Christian Atsu made up for a series of poor deliveries to set up Jordan Ayew, only for the Marseille striker to mishit with the goal at his mercy. Ghana showed improvement after the break, Sulley Muntari firing a metre wide of Tim Howard's upright and then Gyan, unmarked, headed the AC Milan midfielder's delivery from the left over the top. Gyan came even closer when he rose above defender Geoff Cameron only for Howard top tip it away for a corner. Ghana picked up their game and were given hope when Ayew finished off a fine move down the left by latching on to Gyan's backheel inside the area to beat Howard with the outside of his left boot. But their joy was short-lived by Brooks, whose selection for the World Cup by Klinsmann caused considerable controversy. The son of a US serviceman, he was born in Berlin and played for Germany under 20s in 2012 before switching to the US.